Although planning began in 1919, the National Portrait Gallery was not created until 1962, and it opened to the public in the historic Patent Office Building in 1968. Known for its iconic collections of portraits of a broad spectrum of Americans, the gallery is also noted for its Hall of Presidents. 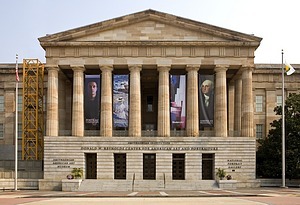 Image of the Reynolds Center for American Art and Portraiture. 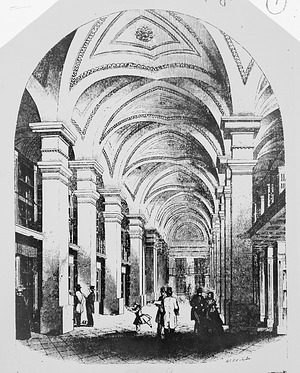 Engraving of the Lincoln Gallery of the Patent Office Building around 1856 shows visitors to the gallery when the gallery was used to display patent models. The Smithsonian American Art Museum (SAAM), formerly the National Museum of American Art, is now housed in this building. 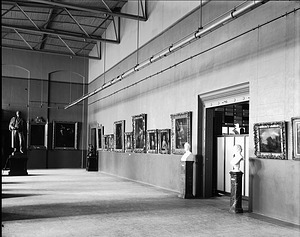 "A corner of the Picture Gallery in the Old United States National Museum Building [now the Arts and Industries Building], November, 1906, before it had been entirely remodeled, showing a part of the Harriet Lane Johnston Collection, William Henry Holmes, September 28, 1920." Image shows paintings on the wall and sculpture on pedestals. At this time, the Smithsonian's art collection was designated the National Gallery of Art, now the National Museum of American Art. War Portrait Room, 1924, located on the second floor of the National Gallery of Art (NGA), now the Smithsonian American Art Museum (SAAM), in the new United States National Museum (USNM) building, now the Natural History Building (NHB). The National Art Commission had been developed to commission American artists to create a pictorial record of World War I through portraits of leaders from America and Allied Nations. The 20 portraits that resulted formed the core of what became the National Portrait Gallery (NPG). 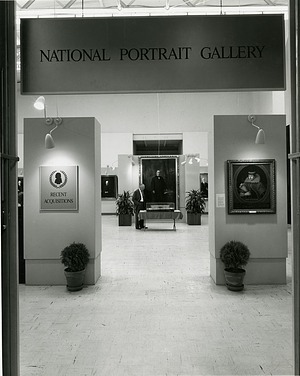 he entrance to a National Portrait Gallery (NPG) exhibition entitled "Recent Acquisitions", which was on display October 4 through November 28, 1966 in the Arts and Industries Building (A&I). 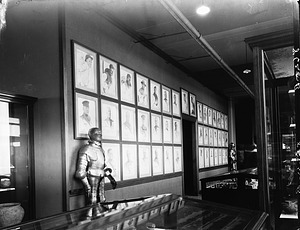 Visible in the photograph are portraits of J. Pierpont Morgan (large painting in center); William McKinley on his left; Warren G. Harding on his right; and Pocahontas on right front panel. The NPG was housed in the A&I Building until 1967 when it moved to its permanent location in the old Patent Office Building, now known as the American Art and Portrait Galleries building. 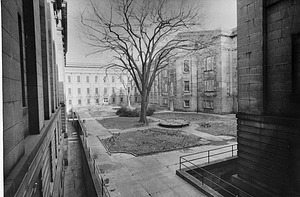 A wintertime photograph shows the interior courtyard of the Old Patent Office Building, new home of the National Collection of Fine Art, now the Smithsonian American Art Museum, and the National Portrait Gallery. "Black Presence in the Era of the American Revolution, 1770-1800"
Opening of the National Portrait Gallery's "Black Presence in the Era of the American Revolution, 1770-1800" with Ambassador H.R. 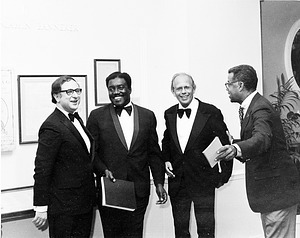 Amonoo, Museum Director Marvin Sadik (1969-1981), Dr. Sidney Kaplan and Chuck Stone, July 4, 1973. 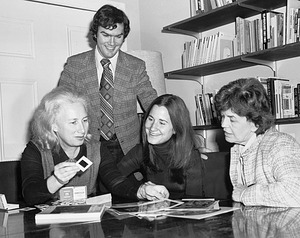 Charles Willson Peale Papers staff: Dr. Lillian B. Miller, Dr. Michael D. Schaffer, Barbara Bares and Rose Emerick. They are in their offices in the National Portrait Gallery. 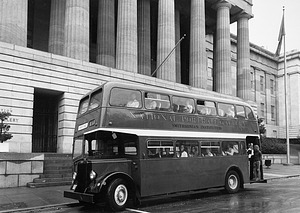 The National Portrait Gallery's free double decker shuttle bus took visitors between the National Museum of History and Technology, now the National Museum of American History, and the National Portrait Gallery in the old Patent Office Building. The attendant on board the bus presented passengers with an introductory talk about the Gallery, its collections and special exhibitions. 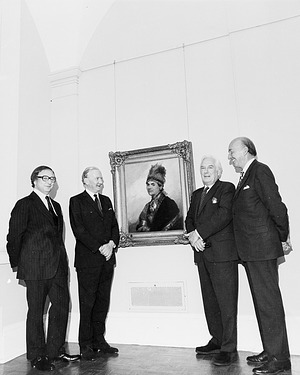 Standing with the portrait of Thayendanega (Joseph Brant) by Gilbert Stuart are (left to right) National Portrait Gallery Director Marvin Sadik (1969-1981), the Duke of Northumberland Ralph Percy, Chancellor and Chief Justice Warren E. Burger and Secretary of the Smithsonian (1964-1984) S. Dillon Ripley. Stuart painted the portrait of Thayendanega, Chief of the Mohawks, in London in 1798. The visit occured in July. 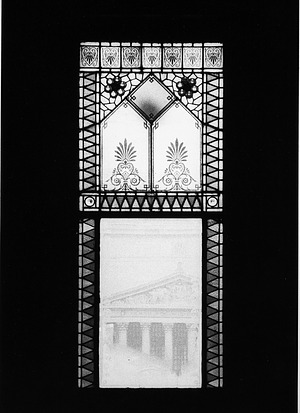 Jean W. Gwaltney of the Charles Wilson Peale Papers took this prize-winning photo of the view of the National Archives Building through a one hundred year old stained glass window in the National Portrait Gallery. 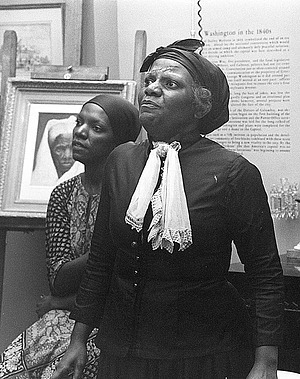 Delores St. Armand as Harriet Tubman at National Portrait Gallery exhibit "Portraits in Motion." 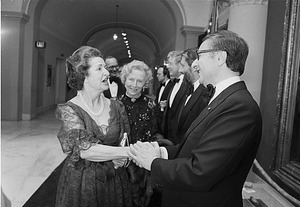 Marvin Sadik, Director of the National Portrait Gallery,1969-1981, greets Lady Bird Johnson at a reception in the National Portrait Gallery in the old Patent Office Building. 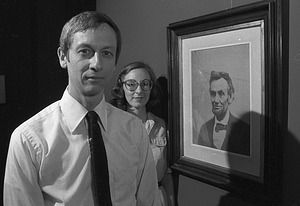 National Portrait Gallery (NPG) curator of Photographs, Will Stapp, and his assistant, Ann Shumard, with the last photograph taken of Abraham Lincoln. In this photograph Stapp is in the foreground, with Shumard behind him and to the right. Removal of old air conditioners from the National Portrait Gallery (NPG). 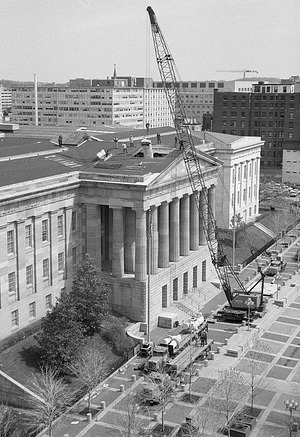 In this photograph an enormous crane is positioned in front of the NPG, lifting the air conditioners through the roof. 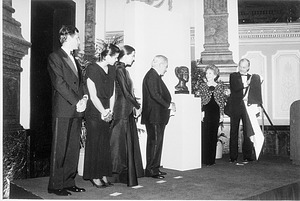 Dignitaries gather at the National Portrait Galley in October of 1986 for the presentation of a portrait head of Princess Grace of Monaco (Grace Kelly) by her family. Includes (l-r): Prince Albert, Princess Stephanie, Princess Caroline, Prince Ranier III, First Lady Nancy Reagan and Secretary Robert Adams. 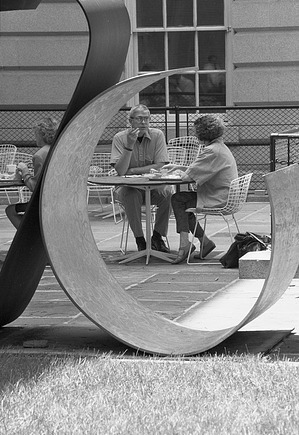 Two visitors enjoy lunch on a beautiful day in the courtyard of the American Art and Portrait Galleries' building, now the Smithsonian American Art Museum. A sculpture is in the foreground. 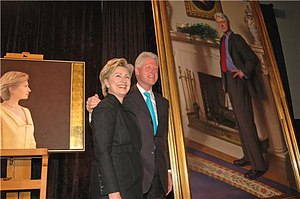 President William Jefferson Clinton and First Lady Hilary Rodham Clinton unveil their portraits which will be places in the National Portrait Gallery. 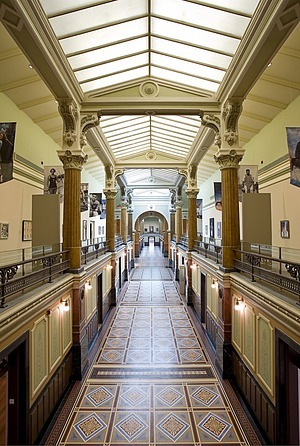 View of the Reynolds Center for American Art and Portraiture interior hallway.